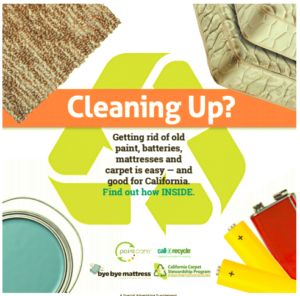 CARE has partnered with product stewardship groups PaintCare, Mattress Recycling Council and Call2Recycle to create a four-page insert on how to recycle old batteries, mattresses, paint and carpet. Some 2.5 million copies of the insert will appear in 25 newspapers around California during April as part of Earth Month. The insert is designed to inform Golden State consumers that carpet, paint, mattresses, and batteries can be recycled (though not put in the blue cart!) and to show the products that can be made from the recycled products. It was produced by Sacramento-based SN&R publications.